Jamaican artist Kuzi Kz and Angella Katatumba hit a fast food point in Kabalagala to grab a quick bite after their 'Out of My Head' video shoot, it was in the wee hours of Saturday morning. Chicken Tonight was their destination and the order was none other than Chicken N Chips, the reggae star demanded for ketchup, which was delivered in a pack of two, ketchup commonly referred to as tomato sauce and chilli. So which one is ketchup, Kuzi Kz asked, waiter pointed on chilli and so Kuzi had to apply a good amount of chilli to his chicken that looked pretty much like Jerk chicken that he is so much used to while in Jamaica. On testing, the 'It's Getting Crazy' singer had his mouth served with hot pepper, which was way too hot for him, he charged at the waiter who did not seem to care that much. 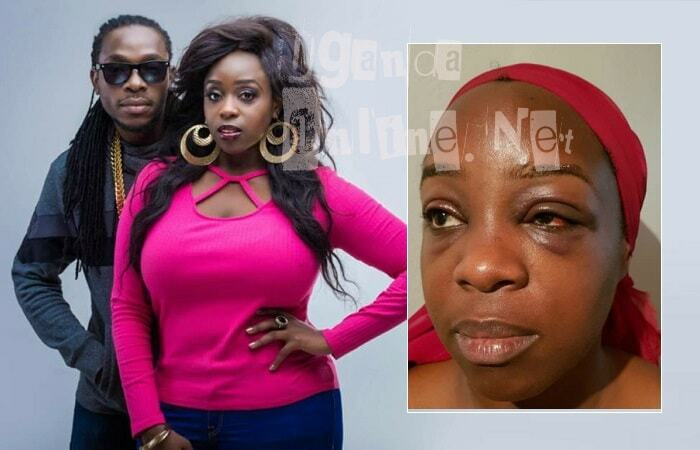 Angella and Kuzi Kz decided to take up the matter with the manager who instead asked them to leave the premises. "The extremely angry manager simply called the watchman, the waiter and the three of them started beating Kuzi in the name of sending him out of the establishment." The three of them beat and pushed both Angella and Kuzi outside. Then in a shocking turn of events the watchman pushed Angella down, mercilessly kicked her when she was on the floor, then even more shockingly as she tried to stumble up, the watchman further grabbed a whole dustbin full of garbage and violently directly hit her on the face with it, automatically throwing the delicate Angella backwards falling on the ground and landing on the back of her head first, where she passed out for a few minutes. The waiter, manager and the watchman are battling with a case of assault and as for the manager, it is alleged that he took the Shs6.2million that was in her purse, he has the charge of theft added on to him. SK Mbuga says he will be released soon. Speaking on phone while in a Dubai prison, Mbuga said Ugandan mafias who wanted to steal his properties were behind his arrest and detention in UAE.